A French Terry stretch cotton Bodysuit that covers the whole body! Perfect for air conditioning. Great outdoors in cool weather. Wonderful to sleep in. Machine wash/dry. Made in the USA. 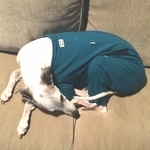 In weather 80 degrees and above Rompers protect your Whippet from the sun. You can cool your Whippet down by wetting the shirt with cold water! Warmth on windy days. A little extra cover on cool nights. Rides in air conditioned cars. Agility practice warm ups. Long stays in cool houses. Protection from the sun. Boat rides and camping trips. Lounging around. Sleeping Jammies! !